Fiji Water, one of the world's most well-promoted brands of bottled water, is also one of the most secretive and private. Owned by Lynda and Stewart Resnick, the increasingly controversial Southern California billionaires, Fiji Water is a symbol of both the bad and the good in the world of bottled water. "Bad" because the massive energy cost and plastic waste produced by shipping bottled water thousands of miles from the island of Fiji to markets in the United States and around the world, and because of their interactions with the unelected military regime in Fiji, which came to power in a coup in 2006. The country has been under martial law since 2009. "Good" because of the benefits the company claims to offer in the way of jobs and other economic returns to local communities in Fiji, and because of their much publicized claims to be "carbon negative" - a claim, by the way, that cannot be independently verified with information provided publicly by the company. Despite their efforts to keep a low profile, however, Fiji Water is in the news, in a big way. This week, Fiji Water threatened to close their water bottling plant in Fiji in a game of high-stakes industrial chicken. Why? Not because they object to the military regime or the unelected government or the martial law. But because the government of Fiji announced that they intend to increase the business tax on bottled water from F$0.003 per liter (a third of a Fiji cent) to F$0.15 per liter (15 Fiji cents). This is the second time this chain of events has unfolded: a previous effort to increase the tax on bottled water also led to a threat to close the Fiji Water plant, and the government backed down. 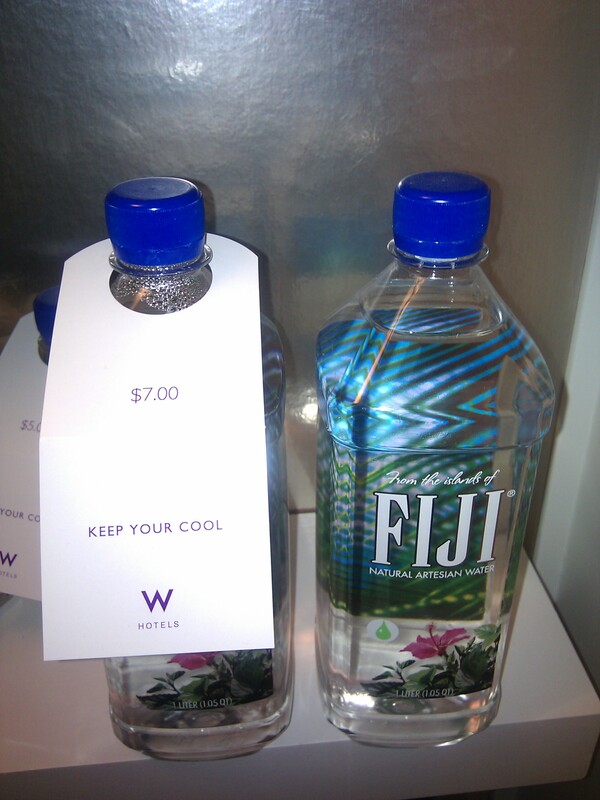 Fiji Water bottles around 3.5 million liters of water each month for sale (at a typical list price of $3-4 per liter, or $7 in a hotel room recently -- see the picture) mostly in affluent U.S. markets. Current Fiji water taxes generate only F$0.5 million annually, but the proposed increase would raise this to over F$22 million. The company can certainly afford to pay something more. For comparison, the trade journal Brandweek put Fiji Water's 2008 marketing budget at US$10 million. According to the Fijian Prime Minister, Fiji Water has enjoyed a huge corporate tax holiday for over a decade, paying less than a million dollars in total corporate tax over the past two years, despite earning hundreds of millions in revenue from sales of product. The government of Fiji also accuses the company of manipulating the way the value of water exports is computed to minimize their tax payments. In a war of numbers, the company in turn argues that it provides lots of jobs, 20 percent of Fiji's exports and 3 per cent of its gross domestic product. Fiji Water is certainly an important economic actor on the island, and it has recently been criticized for tolerating Bainimarama's military regime and for hiring a company with close military ties to provide security for its water facilities. The dispute highlights several questions for bottled water producers and Fiji Water in particular. Should they continue to do business in a country with a military dictatorship, where local communities have little or no say in how local resources are exploited? Does their presence and economic strength in the country help prop up Fiji's government? How can the company claim to be socially responsible when they operate businesses in regions where political instability, government corruption, and a lack of transparency are prevalent, like Fiji. Another problem is that private companies rarely pay any significant royalty or taxes for extracting public resources and privatizing them. Fiji Water and other companies regularly claim that important benefits accrue to local communities, such as jobs, but the economic disparity between corporate revenue and local returns is beginning to cause social disruptions and disputes in some regions. A recent Nestle Waters proposal to build a large bottling plant in McCloud, California foundered for many reasons, but one was that Nestle offered to pay the community a measly 8 cents for every thousand gallons of water it took ($0.00008 per gallon). Finally, the dispute highlights another fundamental question: why on Earth would anyone pay $3 or $4 (or more) for a bottle of Fiji water - literally thousands of times more for water that is not any better than other water available from our own local communities? And don't try to argue with me that it is better in some magical way - almost all U.S. tap water is just as good tasting, better regulated and monitored, and far, far cheaper, as I've described in Bottled and Sold: The Story Behind Our Obsession with Bottled Water. And if you simply can't bring yourself to drink your tap water, there are local brands of bottled water that are also better, with far fewer social, political, and economic liabilities than drinking water shipped thousands of miles from a country with an undemocratic government installed by military coup. The company, meanwhile, has announced they still hope to work out a satisfactory arrangement with the government. I'll bet they do. But maybe it's time to wean ourselves from the bottle. I'm getting a bad taste in my mouth.